Joanna Adamek Kalinowska took the long road to New Zealand. Three years after the Second World War officially ended, Joanna—and about 19,000 other Poles—remained in African refugee camps. In New Zealand, the government gave shelter to 733 Polish children and their 105 caregivers and invited them to stay for the duration of the war. They arrived in November 1944 and had their invitation extended after Poland became communist-controlled. The Poles in New Zealand had been integrating with the English-speaking society from 1946. Some returned to Poland but hundreds of husbands, parents, brothers and sisters joined their wives, children and siblings. In Africa, the Poles, who refused to return to Poland despite the urges of British politicians, had nowhere to integrate. They lived within the hospitality and warmth of the African people and climate while those British politicians finished arguing about their collective fate. In 1946, ships carrying Polish troops and dependants arrived in the UK from Italy. In 1947, passenger ships carrying “displaced persons” from India and Lebanon to Southampton and Liverpool. 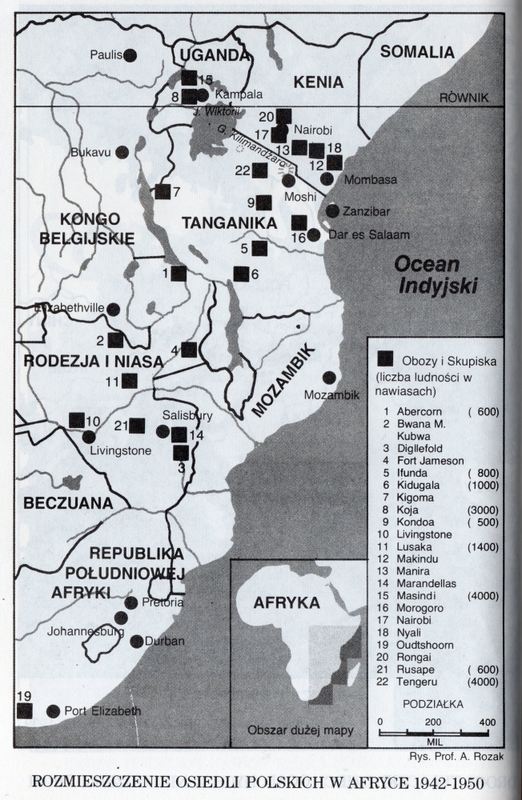 Polish civilians in the African camps only started leaving in 1948. 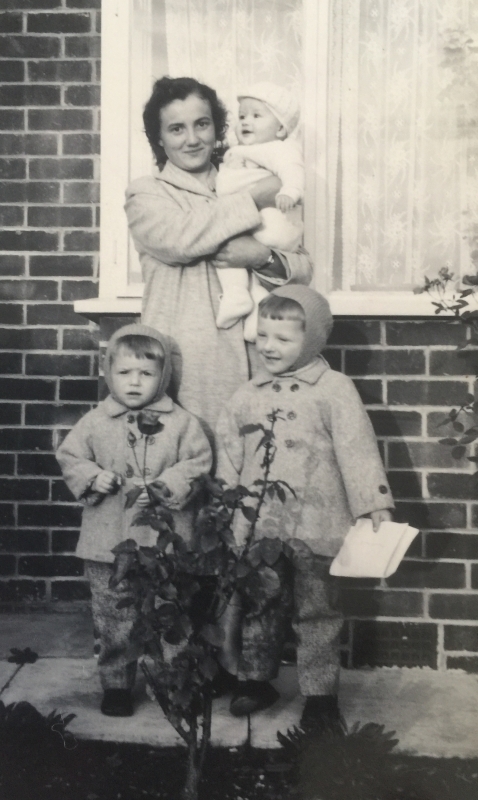 Joanna, with her mother and younger brother, arrived in Southampton in May 1948. She lived in England for 12 years before moving with her husband and sons to South Africa. Thirteen years after that she finally got the chance to settle permanently—in Auckland, New Zealand. When I first met Pani Joanna in July 2018, I was struck by her forthright charm and keen memory and knew I would not forget her sincerity or sparkling eyes. I thank her for her kindness and her time. Joanna Adamek and the towering Ugandan baobab faced each other as the shaking earth made the frightened Polish teenager forget why she was in Africa. For Joanna, two weeks away from her 17th birthday and a survivor of Soviet forced-labour facilities, the unexpected experience became all the more frightening because she had thought that she was safe again. “The earthquake pushed me out of the hut to have a look at what was happening and I noticed the shaking. That baobab stood in the middle of the yard and I saw the ground shaking around it. “I can remember like it was yesterday, the baobab and the ground shaking so vigorously under my feet. I was very scared and started to think, ‘Where can I go?’ But there is nowhere to go once the earthquake starts. You can’t run anywhere. Where are you going to run? You can’t hide. An abrupt change of fortune for Stalin came in June 1941, when Hitler, his former ally, ordered his troops to attack Russia. As the Germans neared Moscow, Stalin’s representative in London, Ivan Maisky, entered into diplomatic talks with Polish Prime Minister and Commander-in-Chief General Władysław Sikorski, who negotiated a deal whereby the Poles in the USSR would be granted ‘amnesty,’4 would be allowed to leave the NKVD forced-labour facilities and would form a Polish army in Russia. Stalin expected the Poles to help protect Moscow from the invading German army. General Sikorski, rather, started to work on getting his fellow citizens out of the USSR. Unaware of the politics behind Stalin’s gesture, the surviving Poles in the forced-labour facilities and prisons needed little encouraging. They left. 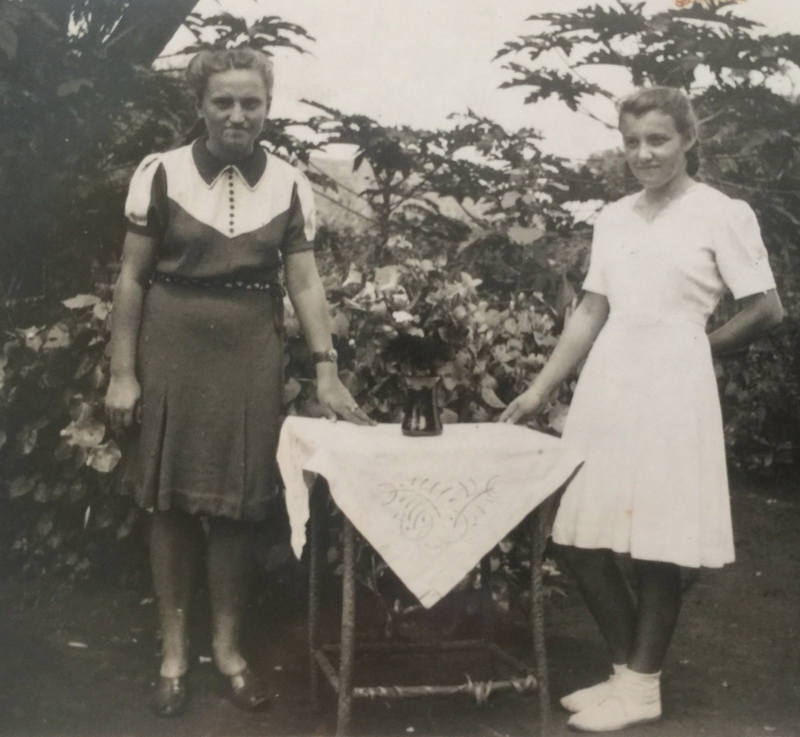 By 1943, Joanna, her mother, Franciszka, and her younger brother, Jan, had joined about 19,000 mainly women and children in 22 temporary Polish settlements in east and southern African countries of the British Empire. In 1942, they and about 115,000 Polish soldiers and civilians had escaped the USSR to Persia, where they came under the joint care of the British government and the Polish government-in-exile in London. “We were told we were going to India. There was a refugee camp close to Karachi, which belonged to India in those days. We stayed only a few months because they said there wasn’t any more room for refugees, so they moved us to Africa. Army lorries took the Poles bound for Masindi most of the way but the last part of the journey had to be made on the Nile river, where Joanna kept a watchful eye on the crocodiles slinking around their barque. 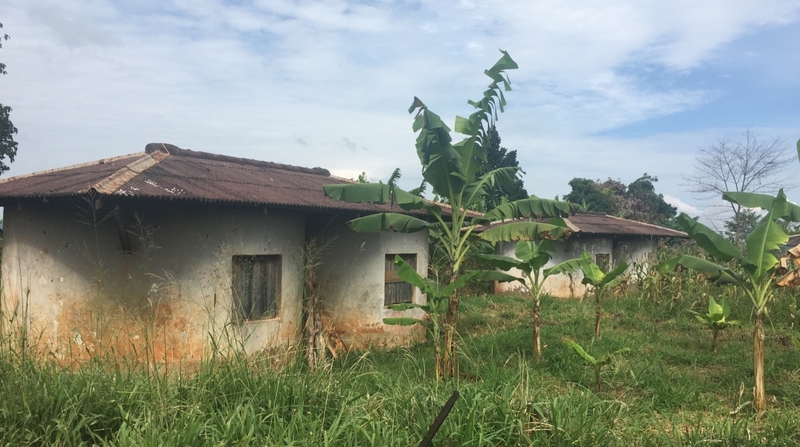 For five years, the Adameks lived in Masindi’s village number three, one of six or seven that housed about 4,000 Poles. Their village was comfortably enough away from the river for Joanna to relax about crocodiles but the roaring lions wandering the roads at night kept her vigilant. “I can’t remember the name of the supervisor of the camp but he and his wife were English and their decisions were final. It was the first time I saw a woman in trousers. I remember them walking along the road and she had three-quarter length trousers. They went for a walk quite often. “I went to the grammar school. Kazimierz Arnold was director. He was, as we say in Polish, ‘jak piła,’ strict with everything. In those days, people in offices everywhere were strict. That’s how it was. 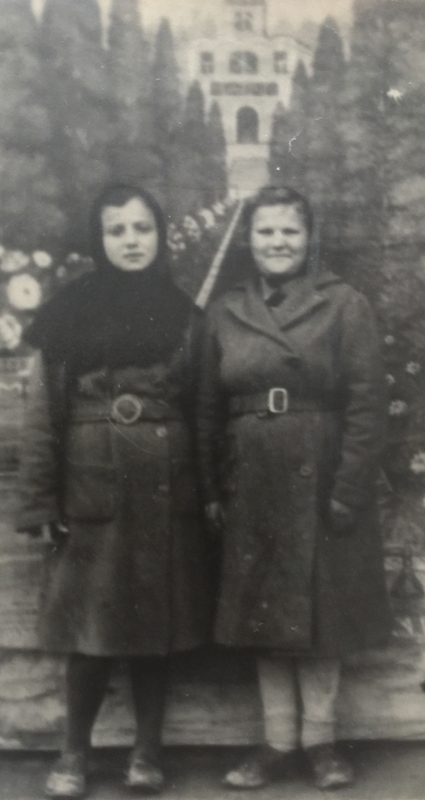 Joanna, right, and a friend in Masini, circa 1944. “I can’t remember Masindi the town but I do remember the settlement. We walked to school and I remember it was very, very hot. Walking home in the afternoons, we wore helmets because it was so hot, exhausting. “For three months—the dry season—not a drop of rain comes. And they call it winter. The grass is all brown; trees drop their leaves. They put a match to it and it burns and after that the new grass comes. It takes a while for new grass to come and that’s when the spring starts. “They have to burn the grass. How otherwise can they control it? It would grow and grow and grow. Joanna knew her nights listening to the roar of lions would eventually end. Three years after the 1945 VE (Victory in Europe) Day, Poles in Africa talked about leaving. Throughout their stay, the Adameks received letters from Joanna’s father, with the Polish army in Italy, and her older brothers, Bronisław, with the air force in England, and Roman in Egypt with the junaki (the military school run by the Polish army). With General Sikorski’s death in a suspicious air crash on 4 July 1943, Poland lost her best diplomatic weapon and Stalin cultivated the British and American Allied leaders to his advantage. In Teheran in December 1943, the same city where scores of civilian Poles remained in tented camps and other temporary shelters, Roosevelt and Churchill bent to Stalin’s wishes and set in motion the means to give him the entire eastern Poland. Two more conferences in 1945, in Yalta and Potsdam, sealed Poland’s fate. By 1948, Soviet-led communists had entrenched themselves in post-war Poland and surviving Poles outside its borders knew the Poland they had left behind had changed dramatically—and for the worse. In 1948, most of the Polish diaspora had lived in an eastern Poland that no longer existed. Joanna Adamek Kalinowska was born on 1 April 1928 in Antoś, a kolonia (settlement) near Brody in then-eastern Poland. She felt her parents could have tweaked her birthday by a day allowing her to avoid the embarrassment of sharing her special day with the one used to tease and make fun of people. She envied Jan, seven years younger, for arriving on 31 March. Franciszek Adamek met Franciszka Dybczak while he was visiting his older brother, Jan, at his farm about two kilometres from where the Dybczaks lived. As volunteers in the war against the Bolsheviks, both brothers had been given the option by the new 1918 Polish government to take up land but, after meeting Joanna’s mother, her father surrendered his to be closer to her. They married. Franciszek moved to the Dybczak farm and worked the land with his in-laws. “He did buy land in Antoś. The settlement was already full but somebody was selling. They worked the gospodarstwo [farm] together, 21 hectares. “They grew everything, wheat, corn, potatoes, and they had a big garden, an orchard and a vegetable garden. “I remember that vegetable garden because we used to steal peas and mak [poppy seed]. They grew the mak for baking. We shook the seeds into our palms and we ate them. It’s what children did in those days. “Babcia used to cook for all of us. She was a good cook and Mum baked. “I remember the bigos and pierogi. Once or twice a week we had meat or chicken, and usually something from a pig that they killed. They salted the meat and made kiełbasa [cured, spiced garlic sausage] and salceson. “The salceson was a mixture of meat and pig’s ears. They put it in the pig’s stomach and cooked it in a big pot. It was lovely. I can still see it. “For the first few weeks after they killed the pig, we had kiszka. It was made of pig’s blood. It was heated, then had some kasza [buckwheat] added and it was delicious. When I think about it now, I have the shivers, I wouldn’t eat it if you paid me, but then it was delicious. You had to know how to prepare it and you couldn’t keep it longer than two or three weeks because there were no fridges in those days. “Everything was kept in the komora, a special dark room for the preserves like the kiszona kapusta [sauerkraut], kiszone ogórki [gherkins] in beczkach [barrels], the preserved tomatoes, which weren’t many, and the kwaśne mleko [buttermilk]. In the piwnica [cellar], we kept potatoes and other vegetables, milk and cream and the salted meat, like the kiełbasa and salceson hanging from the roof beams. “People used every part of the animal. Well, they couldn’t sell it to anyone. The biggest town, Brody, was 25 kilometres away and in those days there were no buses or cars. People had horse-drawn carts. The Dybczak-Adamek farm carried several horses, cows, pigs, chickens and geese. They kept ducks for their feathers, used to make pierzyny (eiderdowns). The effort that went into making each pierzyna made them prized and appreciated bedcoverings. Each feather had to be broken and its tough inner stem removed so only the softest bits went into the fillings. Usually this was “women’s work” but Joanna’s father did not like to be idle in the evenings and joined them. Joanna’s mother excelled in baking and specialised in apple strudels, babka (enriched Easter fruit loaf), “all sorts of” biscuits and steamed and fried doughnuts. Everybody helped on the farm and in high season the family employed extra labourers. Joanna and her brothers walked the few kilometres to school in the summer but in winter, when the snow often lay deep, Franciszek took his children in the sled. Antoś was about two kilometres long, with houses on both sides of the road, occupied by Poles, Czechs, Ukrainians and a few German families. Immediately after the Russians invaded Poland on 17 September 1939, Antoś residents expected some kind of retaliation as payback for the Polish success in the 1919-1920 Polish-Soviet War. They were surprised and relieved when there seemed to be none. “There was not much trust between the Russians and the Poles because of what had happened in the past but they left us alone. There was no persecution or anything like that until the day they took us away. There were more persecutions in Antoś after we left but they seemed to leave the other villages alone. “I had a Ukrainian friend, older than me, at school and I have nothing bad to say about her but after the Russians came some of the Ukrainians were taking advantage of the Poles. “I don’t remember much about that day, 10 February 1940. We got up as usual and then the Russians arrived, two soldiers with guns. It was still early. I can’t remember much but one was following us saying ‘Sobiraysya! Sobiraysya!’ (Get ready! Get ready!) and making us hurry. “The other one stood as a guard outside the house. I don’t know if there were others. Joanna clearly remembers the name of the NKVD forced-labour facility in the Archangielsk region of northern Russia: Szenczuga, near the railway town Konosza. They arrived by cattle-train, its wagons modified to carry people in bulk. “There was a heater in the middle of the wagon. Each time the train stopped, men from the wagon would go and look for coal and bread, if they could get it. The men Joanna spoke of were not supposed to get out of the wagons. Armed Russian soldiers guarded them from perches above but got down during the stops. “I think the guards looked through their fingers because they knew the people were hungry and no one supplied food for us. The soldier walked around the other side of the wagon and people would run out to look for food. “My brother Bronek was one of them. He was about 16. I was 12. He was a very capable young man. Sometimes he brought back a whole sack of loaves and distributed it among the people. He was lucky that they didn’t catch him. “They put us in houses built of big logs. A big family, they put on one side. Smaller families, they put two together, so we were on one side of the house and they on the other. “It was about the size of an average New Zealand bungalow but it was only one room. Along the walls, they had planks, like a long futon, no separation between them, so you slept like that. It was the only furniture. There were nine in the Adamek-Dybczak family: Joanna, her three brothers and parents, her mother’s parents and her grandfather’s brother, Wojciech. The NKVD authority running Szenczuga soon corralled her father and brother Bronisław into the main “Labour for Bread” regime. They disappeared into the taiga to cut trees and returned “maybe” once a month. “They said they went to an old Russian settlement for people deported before us, White Russians. Stalin punished people… if they were a little bit better off than others or said political things he didn’t like. For their labour, Franciszek and Bronisław Adamek received 500 grammes of heavy brown bread a day, some of which they saved to share with their family back in the main Szenczuga facility. The facility provided a daily slice of the bread to those who did not labour. “There wasn’t anything to buy. The only thing they were selling was a bit of brown bread and salt, and sugar at Christmas and Easter. The sugar was rationed and in lumps. There was no milk. It is not clear what Roman did. Joanna is certain he did not go with her to school, which stopped at year four. At the NKVD facilities, all teenagers joined the compulsory workforce at 15, an age Roman reached only a few months before the family left. Soon after they arrived in Szenczuga, Józef Dybczak started coughing and complaining about pain. Joanna recalled her great-uncle Wojciech Dybczak dying that August after a similar but shorter illness.10 She blames her age for not remembering more. Her parents managed to buy a goat from the Russian tubylczy to provide Jan, then five, with milk. Suddenly Franciszek and Bronek returned, released as part of Stalin’s ‘amnesty’ after the signing of the Sikorski-Maisky agreement on 30 July 1941. (For more details, see military timeline on this page.) The surviving family were directed to travel south to one of two enlistment stations. There, Uzbekistani locals grew cotton and lived in what they called kibitki, round tent-huts made of clay with no windows, thatched rooves and round holes in the middle of those rooves for air. The Polish army allocated one for the Adameks, empty because the previous occupants had died. Heat made sleeping outside more bearable. Joanna remembers the scurrying tarantulas and the first time she came across hefty snakes slithering through the cotton fields. To survive, they bought food from the Uzbeks or exchanged “things” for milk. By then, they did not have much left to barter with but used some of the warmer clothing they did not immediately need. They lived from day to day. For the first time Joanna ate yoghurt made from horse’s milk and the local round unleavened breads. There were no shops. Joanna estimates that her family stayed in Uzbekistan for about a year. If they left Szenczuga close to 2 September 1941, they would have been among the first to get to the Polish army’s enlistment stations. Szenczuga was on the southern border of the Archangielsk region, and nearby Konosza, on one of the main rail connections. The Polish army arranged for two mass evacuations of Polish soldiers and civilians from the USSR over the Caspian Sea to Persia (Iran), in March-April and August-September 1942. From Uzbekistan, the Adameks joined one of the Polish military transports to the port of Krasnovodsk (now Turkmenbashi, Turkmenistan), more than 1,500 kilometres west. The Red Cross list of Poles evacuated from the USSR (Osoby wyewakuowane z ZSSR Lista Nr 1.) shows that Franciszka, Joanna and Jan travelled together, and Franciszek and Roman each travelled separately. This suggests that Franciszek had already joined the Polish army and Roman the junaki. Bronek is not on the list, which means he could have already been in England training with the British Air Force. The three Adamek entries on the Red Cross list of Poles evacuated from the USSR all appear on the first page. The list shows dates and places of birth, and destinations. Not all the pages are this blurry. Joanna’s grandmother Franciszka Dybczak did not follow the other Adameks to Persia either. She went to a “rest home” in Uzbekistan and returned to communist-controlled Poland. Joanna believes she may have been in hospital and too ill to leave Uzbekistan with the rest of the family. “She wrote letters to us from Poland. She was quite happy there because she was still able to do things. She helped in the kitchen, cooking, and she enjoyed that. My brother Romek brought her to England in 1950. She stayed with my mother and father and she died there. “In Pahlevi they put us in tents and looked after us. We had common dining rooms. They fed us porridge, bread and cheese and sardines—regular food—and for the first time, I had a cup of white tea. Like the saying goes, ‘Darowanemu koniowi w zęby się nie patrzy’(Don’t look a gift horse in the mouth.) and we were grateful for whatever we got. Joanna, left, and a friend in Teheran circa 1943. Franciszka, Joanna and Jan Adamek arrived in Southampton on another 3 May, this time in 1948.12 The carnarvon castle carried 1,200 what it termed “displaced persons… mostly women and children and the elderly” from then Rhodesia, Tanganyika and East Africa, and put them into the care of the Polish military authority in England. They joined Fanciszek Adamek, already demobilised and living in a Polish resettlement camp near Wymeswold,13 site of a WW2 airfield. The vacated barracks housed the Adameks for “quite a few” years. Roman lived with them briefly. He went to school, then university. Bronisław remained with the British Air Force until he retired. He had finished training in 1945 and had been due to go on his first bombing mission to Germany the day after the war ended. The Adamek family never again lived together. Franciszek and Franciszka moved to Loughborough. Roman lived near Liverpool and Bronisław moved around the UK with different commissions. Joanna and Jan lived with their parents and babcia. “In Aylesbury, close to London, there was a Polish grammar school and I finished the two years before you go to university there, as a boarder. They pressed us to learn English so that’s where I learnt quite a lot about the English language—but I still could not speak. You have to mix with the people to learn how to speak. The cooking/home economics classes offered to her in England did not interest her. 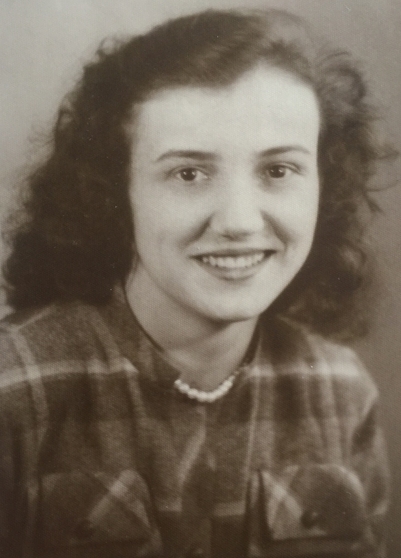 Instead, she worked as a clerk in an accounts department until she married in 1953. Joanna met her husband through Roman. 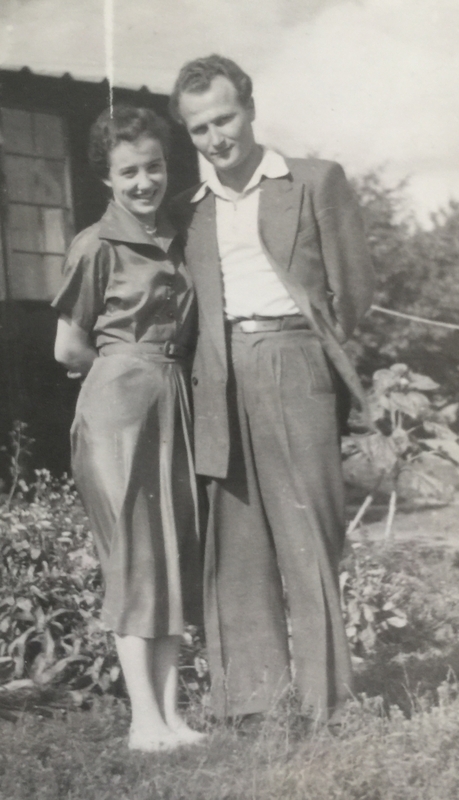 Joanna Adamek and Tadeusz Kalinowski before they married in England. 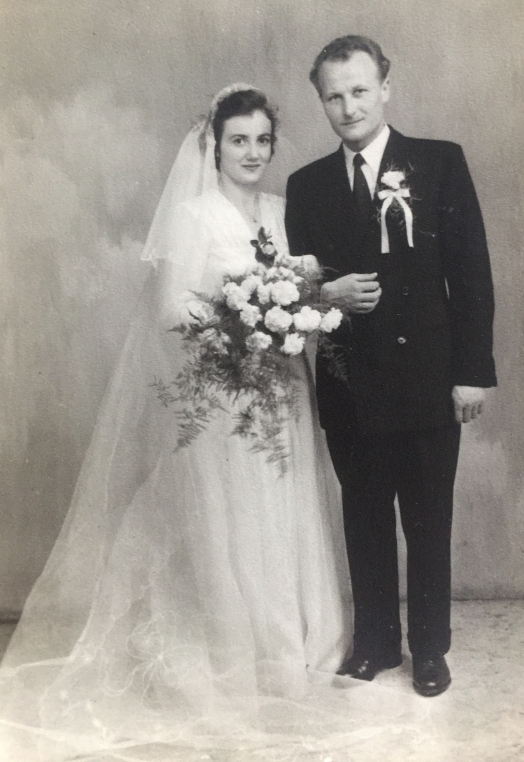 Joanna and Tadeusz Kalinowski on their wedding day, 1 August 1953. Tadeusz Kalinowski, a year older than Roman, served with the II Polish Corps in Italy. He was injured on Monte Cassino. England’s climate did not suit Tadeusz, whose time in Siberia made him susceptible to pneumonia and pleurisy. Tadeusz, his younger brother, Kazimierz, and parents, Adam and Eufrozyna (née Suszko), travelled much farther north than the Adameks, stopping just short of the Arctic Circle. At least 100 kilometres of taiga and lakes sit between Tuszyłowo, on the north-east of Lake Kożoziero (Kozhozero), and the closest railway link on the railway line, which in 1940 ran from Konosza north to Onega. The substantial Onega river runs halfway between that railway link, Letnieoziorskij, and Tuszyłowo. The records state that the Kalinowski family were removed from their home on 3 March 1940, so the Onega may still have been frozen by the time they had to cross it. A satellite image today shows no discernible remains of human activity around the lake, or at the NKVD Połowino forced-labour facility, even farther north. Joanna, holding a nephew, with her sons Bogdan (Bob), right and Marek (Mark) in Loughborough. “On the way back to England, he stopped in Durban. He liked the look of the sea city, much warmer than Johannesburg, so he stayed there for a week and started looking for a job. He worked in textiles and saw an advertisement for a dyer and went to the factory, which happened to be owned by a Polish Jew. He gave Tadek a job straight away and he had to call his baggage back because it was already on the ship ready to go back to England. 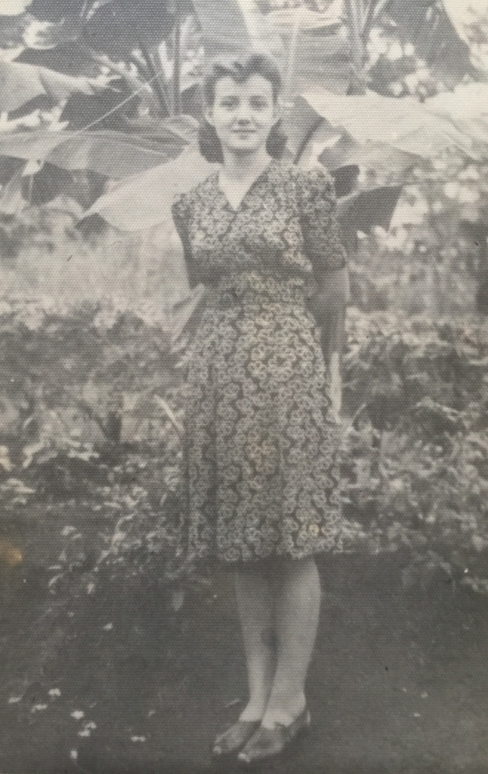 Joanna had been living with her in-laws and in 1960 travelled with Bob (then 3½) and Mark (then 2½) to Durban, where Krzysztof Piotr (Peter) and Anna Maria were born. 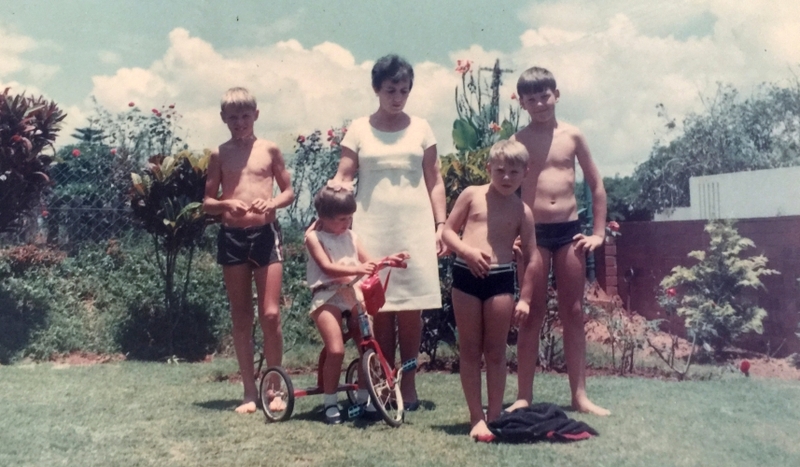 Joanna in Durban with Mark, Anna, Peter and Bob circa 1970. In 1973 Tadeusz again left Joanna and the children—to investigate advertisements for his trade in New Zealand and Australia. Tadeusz chose New Zealand and Joanna arrived in Auckland with three of her children. Mark remained in South Africa to finish his university entrance exams. Tadeusz and Joanna bought a little shop, a dairy, in Mount Eden Road. They lived in the two bedrooms at the back until they found a villa in Fairview Road for $34,000. The huge house had been divided into two units. The walls were made from sacking covered with wallpaper. Tadeusz renovated with proper gib-stopping and paint during time off from his job as a laboratory technician in a clothing factory. Mark joined the family but did not settle in New Zealand. “He didn’t like the New Zealand climate. He was a very good sportsman and he joined rugby and cricket teams but coming from South Africa in those days, New Zealanders were not friendly. They didn’t like South Africans. “My daughter was only seven when she went to school here in Mount Eden. She had a hard time because she was from South Africa. She used to come crying from school because she couldn’t make any friends. Gradually she managed but people from South Africa weren’t welcome here. “Bogdan was with us for one and a half years. He attended university here and corresponded with friend in South Africa, from Maritz Brothers school and with a South African girl. “They married and he brought her here with the intention to settle but she didn’t like New Zealand. She was born in South Africa, and the life there was much easier for white people than here. They went back to South Africa and he is now in Australia. 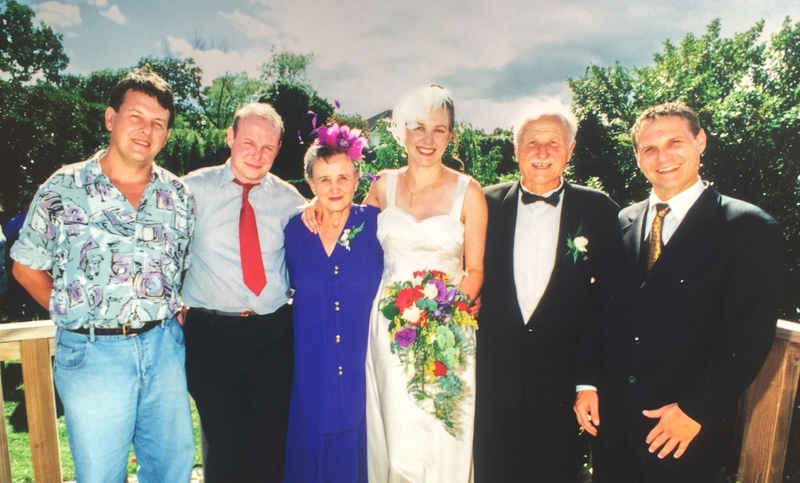 The Kalinowski family at Anna’s wedding in Auckland in 1999. From right, Bob, Mark, Joanna, Anna, Tadeusz and Peter. This was the last time the entire family were together. Tadeusz died in 2005. Franciszek and Franciszka Adamek lived out their lives in England, as did Bronisław and Roman. Jan, now a widower, still lives in Loughborough. 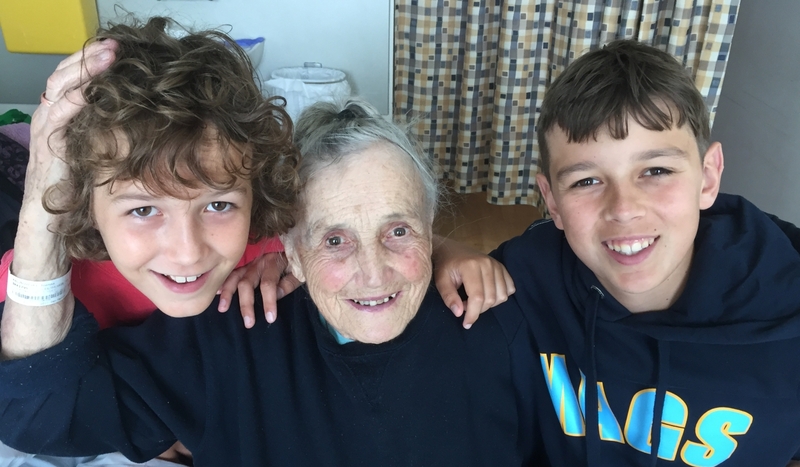 Although Bogdan and Mark do not live in New Zealand, Joanna says in contact with them through the phone and Peter and Anna are regular visitors at the rest home where she now lives, as are Anna’s two sons, Łukasz and Kazik, with their babcia below. Joanna has little space these days to surround herself with physical mementoes of her life but it does not worry her—she keeps her images in her mind. She may be getting more physically frail but she keeps that mind exercised with the world’s goings on through daily newspapers and the television. And the sparkle in her eyes remains. THE PERSONAL PHOTOGRAPHS ARE FROM JOANNA'S DAUGHTER, ANNA SWAIN. OTHER IMAGES ARE CITED BELOW. 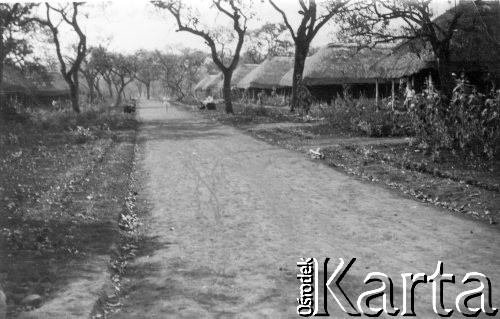 1 - On 18 March 1945 an earthquake in central Uganda killed five people and destroyed buildings in Masaka, about 240 kilometres directly south of Masindi. 3 - These figures come from the late Jagna Wright, who spent the last 15 years of her life researching the background for the film A Forgotten Odyssey, the Untold Story of 1,700,000 Poles Deported to Siberia in 1940, which she wrote, directed and produced with the late Aneta Naszyńska. For a more in-depth discussion on numbers, see Missing Humanity. 4 - I use this word in single quotation marks to suggest that General Sikorski knew full well that the incarcerated Poles, although political prisoners, had done nothing to deserve their incarceration. 5 - Map from Skradzione Dzieciństwo by Łucjan Z Królikowski, OFM Conv., Wydawnictwo Apostolstwa Modlitwy, Kraków. English version translated by Kazimierz J Rozaniatkowski. 7 - Photograph by A Torres. Published on the website of the Embassy of the Republic of Poland in Nairobi, 21 December 2018. 8 - Franciszka’s birth name was Holboj. 10 - Ibid. The KARTA Indeks Represjonowanych shows that Wojciech Dybczak died on 15 August 1940. 11 - This may not be the correct spelling. If anyone knows more, please get in touch through our home page. 13 - This could have been part of the Polish Resettlement camp in nearby Burton on the Wolds. 13 - Information through the Karta Indeks Represjonowanych, ibid above, and the 1949-1941 map by Aleksander Gurjanow of the forced-labour facilities holding Polish civilians in the Archangielsk region.